What’ll happen if the cat carrier is too small? What if you have a kitten? What size carrier for a 12-pound cat? Is my cat carrier too small? What size crate for 2 cats? I know I have written about this topic before. But, the topic seems to be so important that I want to dedicate a whole article to it. 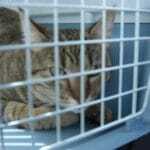 If you get a wrong sized cat carrier for your cat, no matter how costly it is, it would be bad for your cat. On the other hand, a right-sized carrier, even if it costs less, would be perfect for your cat. I have seen that most cat owners often overthink about what type of cat carrier to get. I know there are probably 4 to 5 different types of cat carriers and it is important to get the right type for your cat, however, the more important thing to figure out is what size cat carrier should you get for your cat. This article will help you as a cat carrier size guide. I’ll share everything with you for getting the right size cat carrier for your cat. A rule of thumb is, you can check if a cat carrier has the right size by simply looking at your cat. If she can stand up without crouching and can turn around, then this is generally a right size carrier for your cat. This is enough if you want a carrier to take your cat to the local vet office. However, if your purpose is a long journey with your cat, then couple other things have to be considered for choosing the right carrier. First, make sure that there is enough place inside the carrier to accommodate a litter tray, food bowl and water bowl. Many cat carriers these days come pre-packaged with these items. So, if you can grab one of those, it will be pretty great for your cat. However, if the price range is out of your hand, then get a carrier that can accommodate these items and at the same time leave enough space for your cat to move around. If the above discussion in any way make you think that, the larger the cat carrier is the better, then I am sorry my friend, you are wrong! When it comes to cat carriers, the larger isn’t always the better. Let me explain. Cats are not very fond of traveling. They hate to leave their comfort place and go on an unmarked territory. So, if you get a very large cat carrier for your cat, chances are that she will feel very scared in it and hide in a corner of the carrier. Always keep in mind that, your cat should be able to feel her back against the wall of the carrier. it will give her a sense of security. Take a measurement tape and measure the length of your cat from the nose to the tip of the tail. Now, multiply that by 1.5. The result you get should be the right length for your cat carrier. Now, there is no guarantee that you’ll get exactly that length carrier for your cat. Try to get the closest one possible. Suppose, your cat’s length is 8 inches from nose to the tip of the tail. Now, multiplying that by 1.5 gives 12 inches. So, you need to get a cat carrier that has a length of 12 inches. However, if you can’t find any cat carrier of that length, try to see if there is an 11” or 13” length carrier. this way, you’ll get a pretty right size carrier for your furry friend. If the cat carrier is too small, your cat won’t be able to move around at all. Being stuck in a position, it will be very uncomfortable for your cat. This may also cause body pain to your cat’s delicate body. 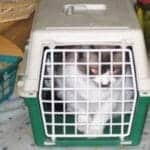 Being in a very small carrier may make your cat feel like imprisoned or trapped. She will also get suffocated very quickly. 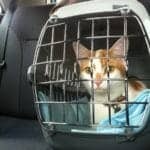 If the road trip is long, you shouldn’t be surprised if your cat becomes sick. Frankly, making your cat get into a small carrier is kind of inhumane. You won’t like if someone forces you to get into a cupboard size room for 2-3 hours long. So, why would your cat? I know I said that your cat should be able to stand up and turn around in the carrier. The length of the carrier should be at least 1.5 times the length of your cat. However, this rule doesn’t hold if you have a kitten. Kittens have very large growth rate. So, suppose you got a carrier that is 1.5 times larger than the length of your kitten. But within a couple of months, you’ll discover that your kitten has outgrown the carrier. Then you’ll have to buy a carrier again which is painful. So, if you need a carrier for a kitten, the smart thing to do would be to figure out what size your kitten will be when she is adult. Take into consideration her current size, how much time left to reach the adult stage as well as her breed. If you are not comfortable at this, take help of a cat expert. Now that you figured out what may be the size your kitten will be when she is adult, you can multiply that by 1.5 and get a carrier equal to that length. It will ensure that you won’t have to buy a new carrier every couple of months for your kitten. 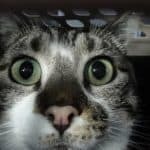 If you are still quite confused about getting the right size carrier for your cat, then fortunately for you, thanks to jetpets.com.au, they have a travel crate size calculator for you to figure out the perfect dimension of the carrier for your pet. This calculator will act as a guide for you to get a hold of the minimum size carrier you need to buy for your cat. Using the calculator is very simple. All you have to do is insert some data and the calculator will calculate the required size based on the input you provided. You’ll have to provide all the input data in cm scale. In the first box, you need to input the length of your pet from top of the nose to the root of the tail. In the second field, input the data from the ground to the highest point of your cat. The highest point will be your cat’s head. In the third field, input the distance from the ground to the elbow joint. Lastly, in the last field, input the distance from one ear to the other ear of your cat. At last, you need to answer two more choose from the below type questions. The first question is does your pet has a snubbed nose or not. The second question is, are you planning for a domestic travel or an international travel. After providing all the necessary information, press the Calculate button and Vola! Soon, you’ll be presented with the minimum size that your carrier needs to be for your cat. Most adult cats weight between 9 to 12 pounds. So, if you have a cat of 12 pounds, chances are that she is in the adult stage of your life. To determine the size of the carrier for such a cat, all you need to do is, measure the length of your cat from the tip of the nose to the root of the tail and multiply it by 1.5 times. The answer you get will be roughly the size of the carrier you should aim for. If you are planning on an international travel with your cat, then you’ll have to check with the airline guidelines and check if your carrier meets those guidelines. Airlines have pretty strict rules about carriers when you are transporting the pet. For a long road journey, aim for a roomier cat carrier. Check that if your cat can stand up and move around inside the carrier freely. it will make her feel relaxed and less nervous. If the carrier is for a trip to the vet, then you can be more flexible on the size and get one that is roughly the same as the length you calculated earlier. You can easily check if your cat carrier is too small for your cat. All you need to do is measure the length of your carrier. Then, measure your cat’s length from the nose to the root of the tail and multiply it by 1.5. if the multiplied result is too large than the measured length of the carrier, then the carrier is too small for your cat. Another way to determine if the carrier is too small is inserting your cat into the carrier. Check if she can stand up without crouching and turn around freely. if she can’t, then the carrier is too small for your cat. Nothing can be worse than a small carrier. if you are going to buy a carrier for your cat, always ensure you are getting the right size by implementing the technique above. If you have already bought a carrier and if it is too small, then, unfortunately, you need to buy another one that is the right size for your cat. Generally, it is not a good idea to keep 2 cats in a single carrier. The cats may fight with each other and injure themselves. So, if you need to travel with two cats, it is better to get two separate carriers for them. However, if you need to carry both cats in a single carrier, then you need to get your hand on the largest crate possible. It is better if you check on the dog aisle of the market as the cat aisle generally contains smaller size carriers. This is an airline approved carrier. so, you can travel with your cats internationally with this carrier. The thick wire frame provides extra stability and rigidity to the structure of the carrier. Pets up to 14 pounds can be carried in it easily. It can be expanded into two sides which provides more room for your cat. Also, it creates more ventilation inside the carrier which is very crucial for your cats. The carrier includes a bowl, adjustable shoulder strap as well as a fleece bed. It also has a side pocket to store important items of your cats such as leash, medicine, food or treats. 100% money back guarantee if you are not satisfied with the quality. So, if you are interested, you can check out the current price here. This is my guide to choosing the right size carrier for your cat. 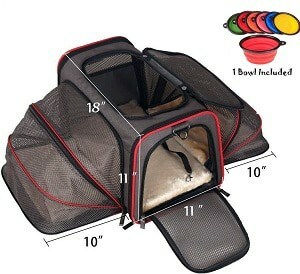 I hope this cat carrier size guide helps you to determine the perfect sized carrier for your cat. Ask me if you have any question in the comment box below. I’ll reply as soon as I can. Happy traveling with your furry friend!